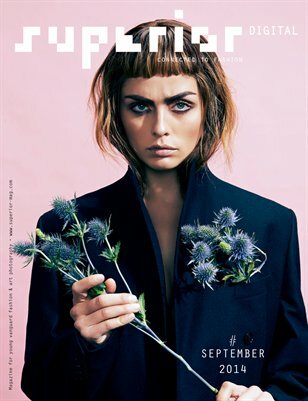 SUPERIOR DIGITAL September 2014 - Exciting international FASHION EDITORIALS from around the world | SUPERIOR is an international MAGAZINE featuring the creative scenes of fashion, design, art, culture & lifestyle from the most exciting cities around the world. SUPERIOR Magazine stands for highquality content that is a fund of new insights and inspiration. The magazine features in six categories exciting PEOPLE from various creative fields, young vanguard fashion and art PHOTOGRAPHY, inspiring films and videos under MOTION, the cities’ most exciting HOTSPOTs, a SELECTION of musthaves and the EVENTs one should not miss. SUPERIOR Magazine’s sophisticated design provides an artistic showcase for all kinds of vanguard visual expression and imagery. SUPERIOR Magazine is published across all media channels - DIGITAL, MOBILE, PRINT and WEB - with a strong link between the channels.